Family gatherings are a way of life for us. There’s something about food and fellowship, that just feels good to the soul! Comfort food that fills your belly is the best type of food for family gatherings, but that type of food is generally associated with the colder months. With a little creativity, however, the fun family meal experience can be extended all year long! The biggest complaint I hear about cooking for summer gatherings is that it’s just too hot to enjoy anything. No one wants to find themselves stuck in a hot kitchen all day long on a beautiful day. This means that they usually forgo a hearty home cooked meal, and instead opt for lighter snack foods. While both are a good option, I’m a firm believer that you can never have too much of a good thing. Instead of choosing between the two, I opt for both! Klement’s wide array of products has become a staple in our home, all year round. I love having options, and with Klement’s I feel like I can make any type of meal I desire, regardless of what the weather is like. 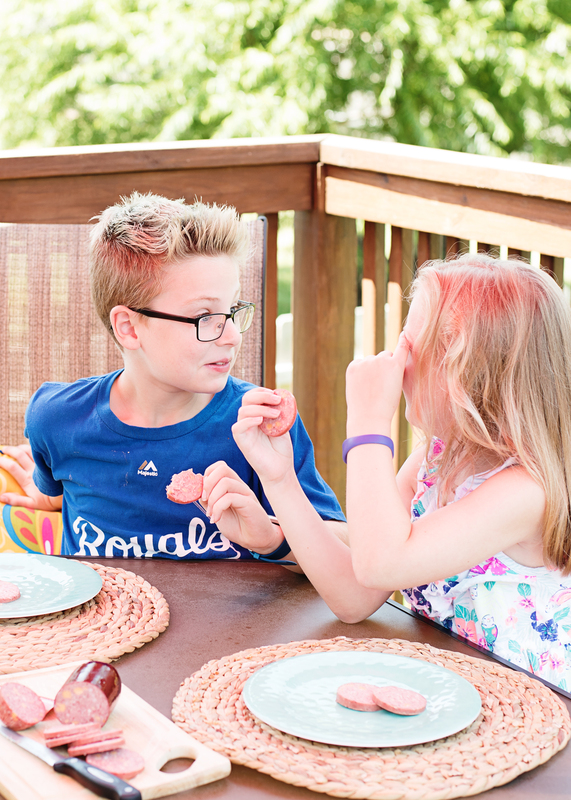 The Klement’s Sausage is a food I always try to keep on hand, since it comes ready to go. You can cook it in recipes, but you can always enjoy it as is, straight out of the pack. It’s perfect to have on hand if you’re busy and need a quick snack on the go. Just toss Klement’s Snack Sticks in your bag, for a delicious high-protein choice. 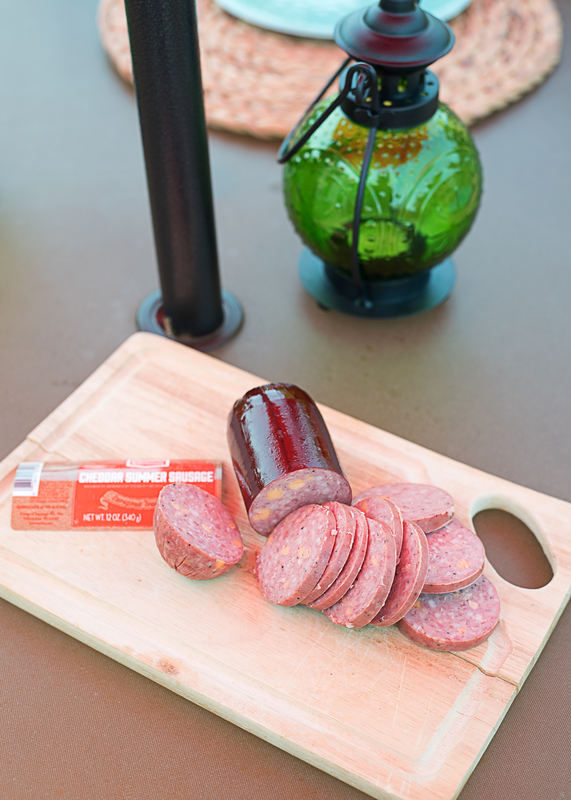 If you’re health conscious, you’ll be pleased to know that they contain real hardwood-smoked sausage with only premium ingredients. A snack you can feel good about AND that taste good is always a winner in my book. Snacks are great, but for our family gatherings I prefer a full meal. I want to leave my guest (and family) with a full tummy, without spending most the day tolling away in the kitchen. 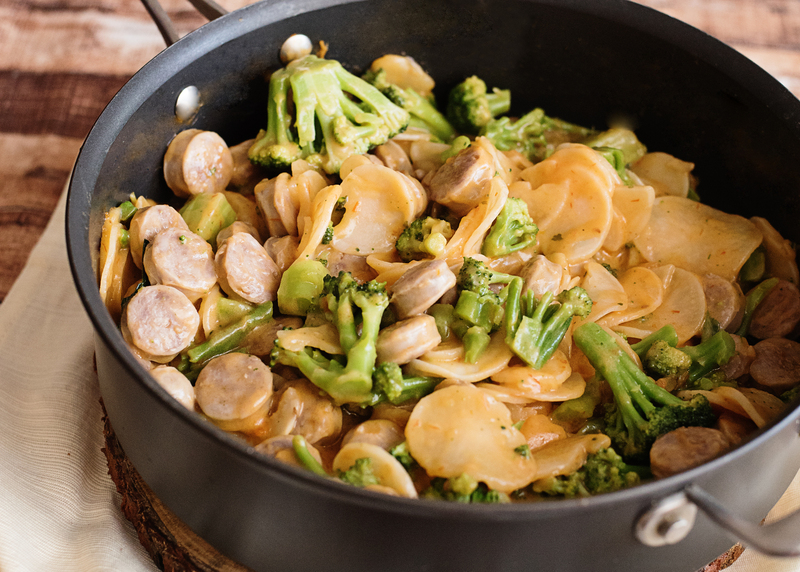 My meal of choice is a quick and easy skillet, made with Klement’s Brats! 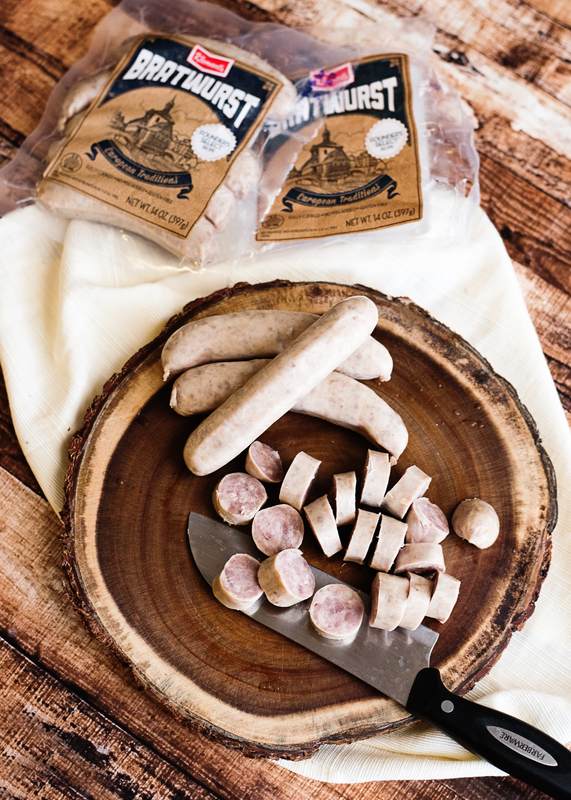 Just like the other Klement’s products, Klement’s Brats are made only with premium ingredients, and an authentic European recipe. They are delicious and are sure to please even the pickiest eaters. When I was asked to contribute a recipe for #WhatsCookingWednesday these were the first thing that popped in mind. Why? Because what goes with Wednesday better than a meal that is FAST?!? I can whip up this meal at a moment’s notice, which is essential for those impromptu summer get-togethers. This recipe is simple enough for even the most novices of cooks, yet yummy enough to please your toughest critics! To make my Klement’s Brats Skillet, I simply cook boxed scalloped potatoes according to the package, mixing in sliced Klement’s Brats and salsa once the potatoes reach their boiling point. I then cover and let the mixture simmer for about 20 minutes, stirring frequently. Lastly, I stir in broccoli and cook about 8 minutes longer, until the potatoes and broccoli are both tender. The sauce in the skillet will thicken, and be full of flavor! That’s it! As simply as this meal is, it receives just as many compliments as my most complex creations. 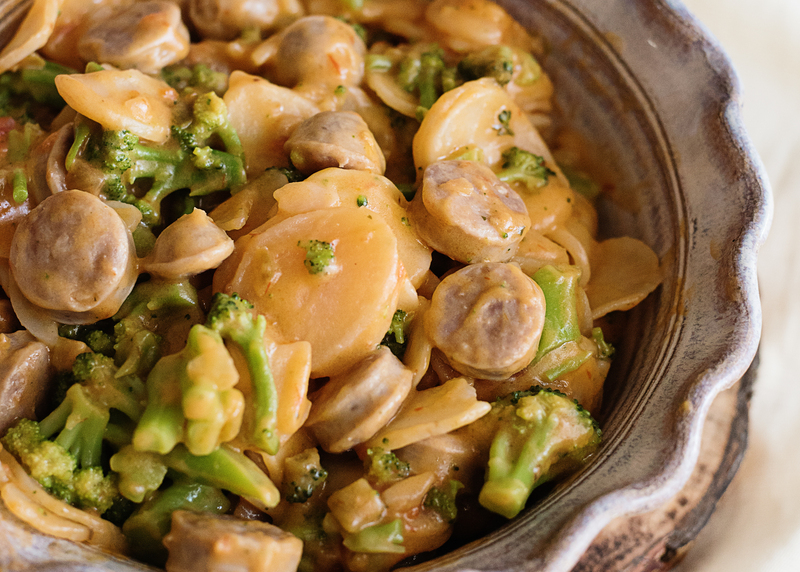 The rich flavors and savory taste, got well with this full course one skillet masterpiece! Eager to whip up some summertime Klement’s creations of your own? Head to Klement’s.com for new ideas, recipes, and to locate Klement’s at a store near you! Stir the scalloped potato sauce mix, hot water, milk, butter and potatoes in a large skillet. Heat just to boiling, stirring occasionally. Add the bratwurst and salsa; stir until well mixed. Reduce heat; cover and simmer about 20 minutes, stirring frequently. 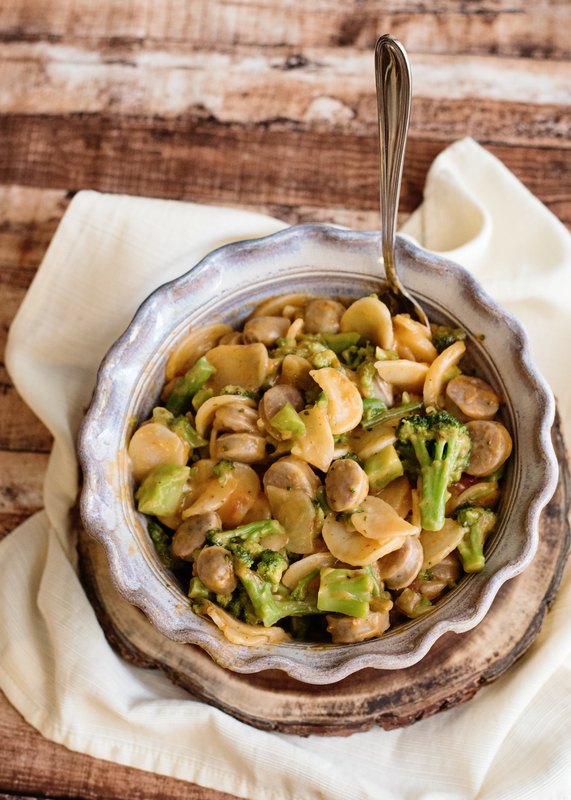 Stir in broccoli. Cover; cook 8 minutes longer or until potatoes and broccoli are tender (sauce will thicken as it stands). ← Tilapia Foil Packets Grilled or Baked Lemon Recipe – Both Ways! I Bet You Didn’t Know Pancakes Could Be THIS Good!